Modern to contemporary home style pendant shown with filament bulbs (not included). Straight lines and geometric shape adds sophisticated style. Perfect for minimalist and industrial dicor styles over dining area. 3 Year Limited Warranty. Please call 1-800-986-3460 for additional information. 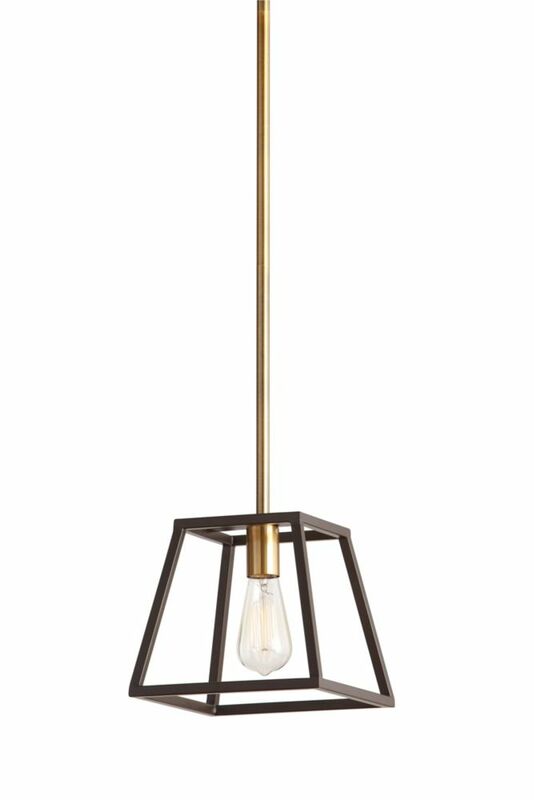 1-Light 60W Gold Pendant with Dark Bronze Metal Frame Shade Modern to contemporary home style pendant shown with filament bulbs (not included). Straight lines and geometric shape adds sophisticated style. Perfect for minimalist and industrial dicor styles over dining area. 1-Light 60W Gold Pendant with Dark Bronze Metal Frame Shade is rated 5.0 out of 5 by 2. Rated 5 out of 5 by Jean 87 from Look great! We had a ball type light right at ceiling level. It was impossible for my husband or myself to climb up to change the bulb, and hated to always have to wait until someone was available to do this for us. We are in our late eighties, and have medical problems that limit our mobility. With the Pendant light installed at a level where my 6 foot husband can reach, it enables us to be more independent. We love the look of it, and would recommend it to anyone who is looking for an attractive light fixture. Rated 5 out of 5 by Abbyk from Lovely! I'm a former interior designer with champagne taste and a beer budget and have been looking for a light like this for months. It looks like it could've easily cost three times as it did, and took me less then an hour to install. It's a home run! Whats the bulb type going on this? I am thinking of putting in E26 type Philips Hue. Will that work? Thank you for reaching out, this item takes E26 bulbs. Thank you!